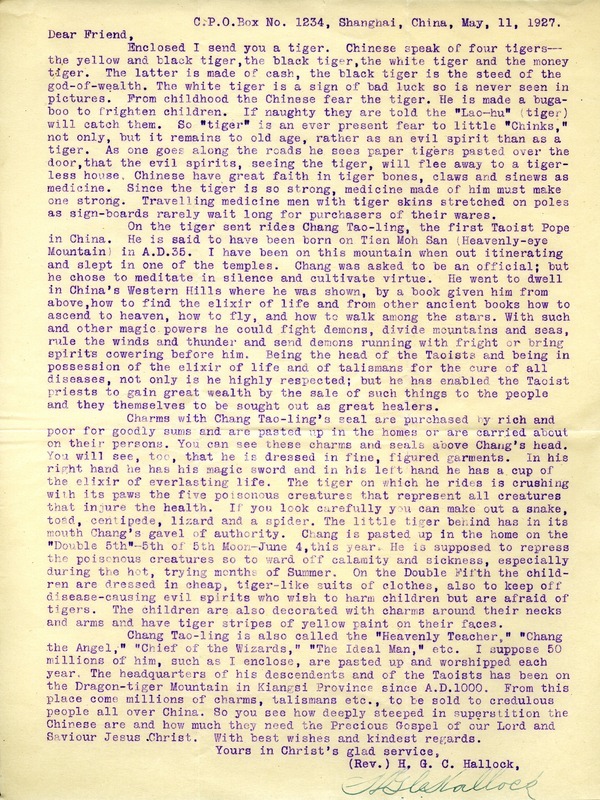 Reverend Hallock encloses a tiger pin-up and then explains the Chinese legends, beliefs and traditions associated with the tiger and with Chang Tao-ling, the first Taoist Pope in China. He concludes his letter with his belief that the Chinese greatly need the Gospel and Christianity. Rev. H. G. C. Hallock, “Letter to Martha Berry from H. G. C. Hallock.” Martha Berry Digital Archive. Eds. Schlitz, Stephanie A., Chelsea Risley, Rachel Renaud, et al. Mount Berry: Berry College, 2012. accessed April 25, 2019, https://mbda.berry.edu/items/show/4325.